When Emily Dickinson died in 1886, it was with astonishment that her sister Lavinia discovered close to eighteen hundred poems, many arranged into handbound booklets, packed away in a box. Four years later, when the first selection of her work was published to an appreciative readership, something had been subtly altered in the appearance of the poems. Dickinson’s style of punctuation was so at odds with the poetic conventions of the day, it was viewed as a weakness by the literary editors appointed by her family. As a result, they set about re-punctuating and ‘improving’ the texts for publication, and in doing so interfered with what was most unique about them – the lightning dash-driven impression of a brilliant mind in action. The energy in this poem is manifested by an exhilarating combination of declaration, sigh, and flow, the clauses simultaneously joined and held apart by the poet’s signature dashes. As if those longed for nights weren’t wild enough, they are repeated three times – a classic rhetorical device – and capitalized on top. And finally, not one, but four exclamation marks: all available bells and whistles are being employed. The punctuation in any poem serves as a set of instructions to the reader as to how it should be spoken aloud. Commas, semi-colons, full stops, line breaks: all of these can control the pace and rhythm with which another person may speak a poet’s words. There has been much speculation as to what the dashes in Dickinson’s poems may signify, but one thing is for certain, they do not translate into the commas and full stops preferred by her early editors. The Dickinsonian dash can be seen, perhaps, as both bridge and river, both connector and divider of the words and clauses. It adds a liveliness and fluidity to the syntax, being somehow less ‘settled’ than conventional modes, and the effect can be to revitalize the language. 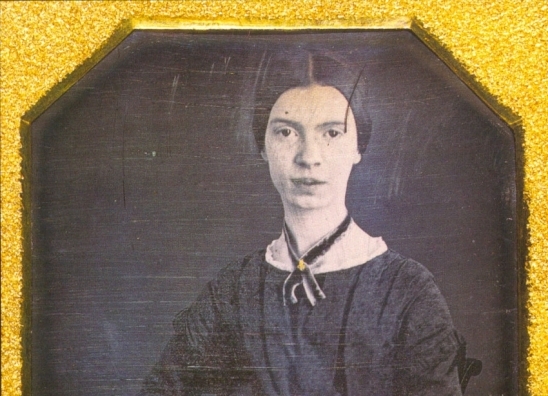 Emily Dickinson was a mysterious figure in the social world of Amherst, Massachusetts, confining herself to her father’s house for much of her adult life. She is also something of an enigma when it comes to poetic form; she is both the least adventurous and the most original of poets. Her verse forms are more related to the common meter of traditional hymns (alternating 4-beat and 3-beat lines – as in, for example, the poem above) than to the iambic pentameter of literary tradition. And yet, her idiosyncratic methods of denoting breath, emphasis and pauses, add up to an unforgettable reading experience. This image encapsulates an experience familiar to most of us, whether poets or not, losing a precious spark of inspiration to the “prosy winds” of everyday responsibilities. Like many of Dickinson’s poems, it ends on a dash. Perhaps she is simply leading us back into the silence out of which each poem emerges. Dickinson created poems as durable as diamonds without ever receiving the boost of publication. She reminds us that poems have a life of their own, beyond the uncertain arena of contemporary reputation. One wonders what such a private poet would make of our curious age of self-promotion. Today, that closing image might translate to “an admiring Blog”. “If I read a book [and] … feel physically as if the top of my head were taken off, I know that is poetry,” wrote Dickinson in a letter. Her own Collected Poems is just such a volume – offering up new ‘jewels’ on each return. Colette Bryce is an Irish poet who lives in the North East of England. Her collections include The Full Indian Rope Trick (Picador, 2004) and Self-Portrait in the Dark (2008) and she worked as Poetry Editor at Poetry London from 2009 – 2013. Her latest collection, The Whole & Rain-Domed Universe, was shortlisted for the Forward Prize for Best Collection.